composed with Empress Paulownia (paulownia tomentosa) leaves harvested from Chamberlayne Ave., in RIchmond’s Northside. 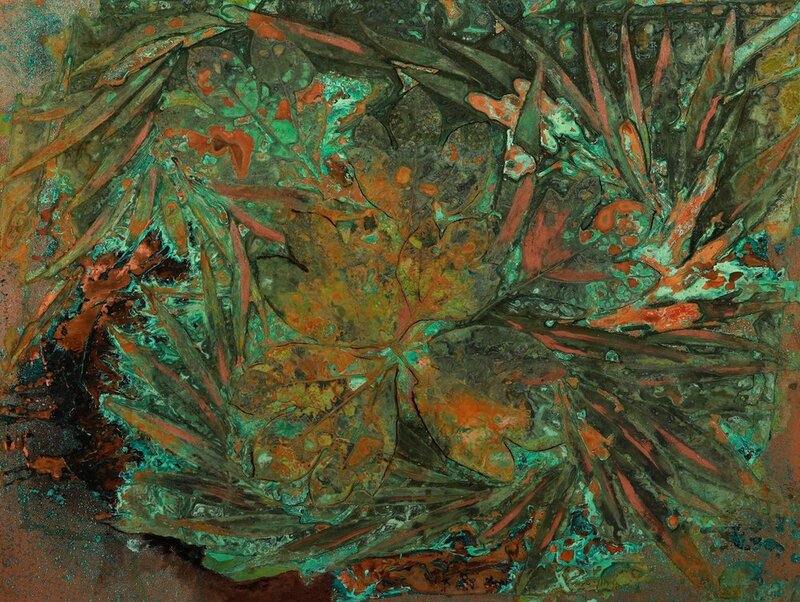 copper tryptic with solvent dye over leaf etched patinas. This is a departure from my usual patination process. The three panels were etched over a month [while I was traveling in Argentina!] and then lightly sanded. A full neutral wash was laid over the entire surface, and then solvent dye was stamped and brushed to enhance the composition. The panels may be hung aligned or not, in order or not. Tryptics give you the opportunity to play around with how the final composition looks in your home. 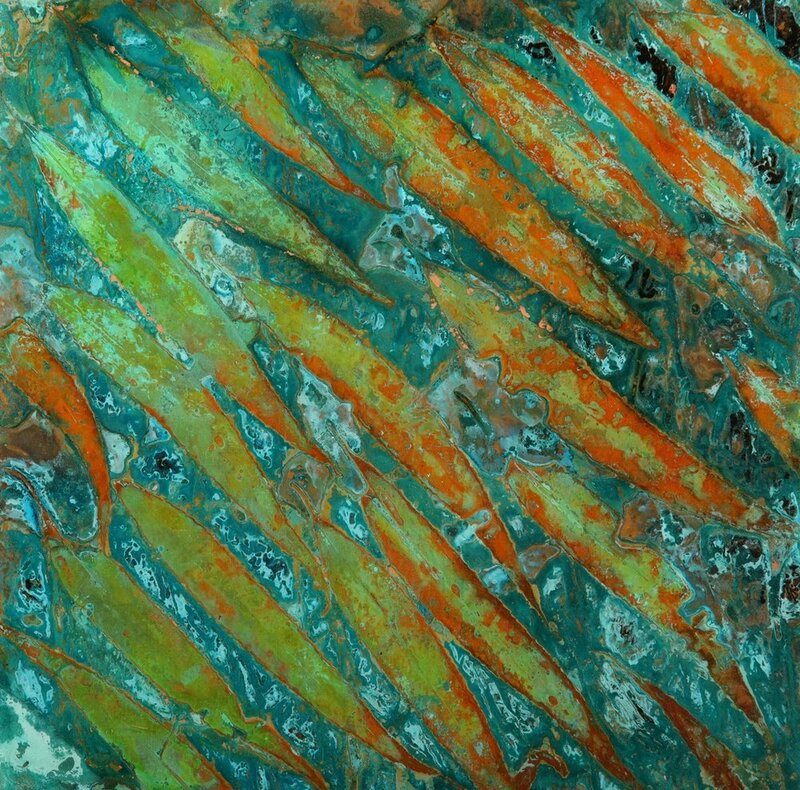 composed with fern fronds harvested from Betty Handy’s back yard, Powhatan, VA.
composed with fern abstractions, hammered and verdigrised copper sections, collage on wood. composed with Tulip poplar, hickory, elm, maple, beech, red oak, white oak, and sweet gum leaves with a monochrome mint verdigris. A nod to one of my favorite Grimm fables, the Bremen Town Musicians. I love the notion of using one’s wit and resourcefulness in finding a different path. composed with sweet gum, red oak, white oak, tulip poplar, and hickory leaves on copper panel, lacquer finish. 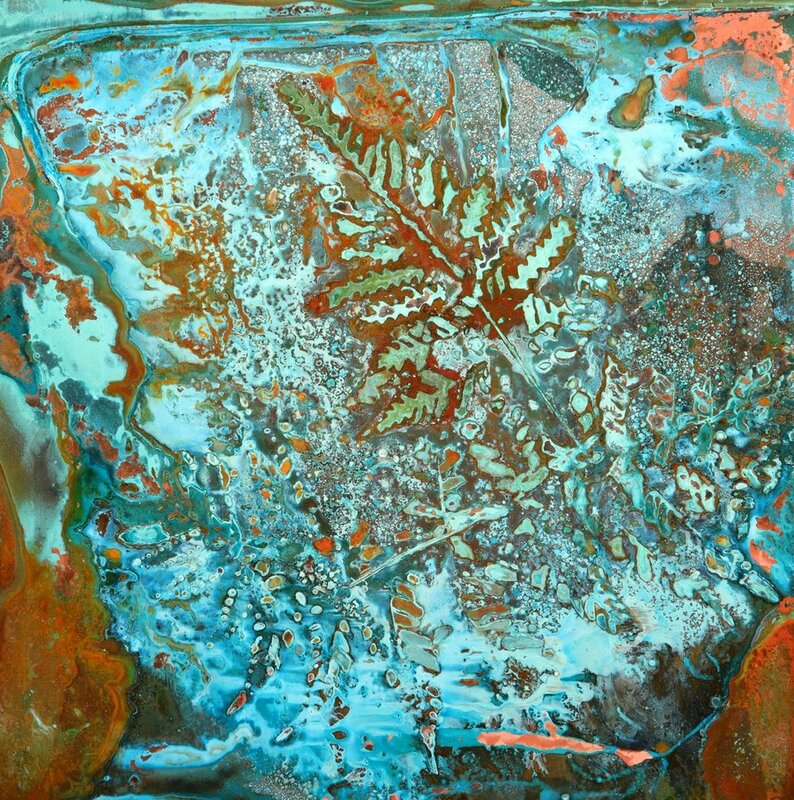 See it in person at Crossroads Art Center, now through February 15! composed with oak leaf hydrangea leaves on copper. Purchase online at BUYRVAART. 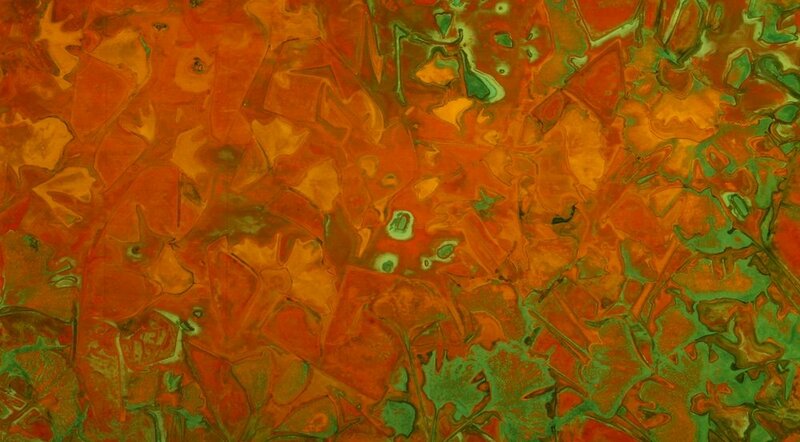 composed with a giant paulownia tomentosa leaf on copper panel, lacquer finish. Purchase online at BUYRVAART. or see it in person at Crossroads Art Center, now through February 15! 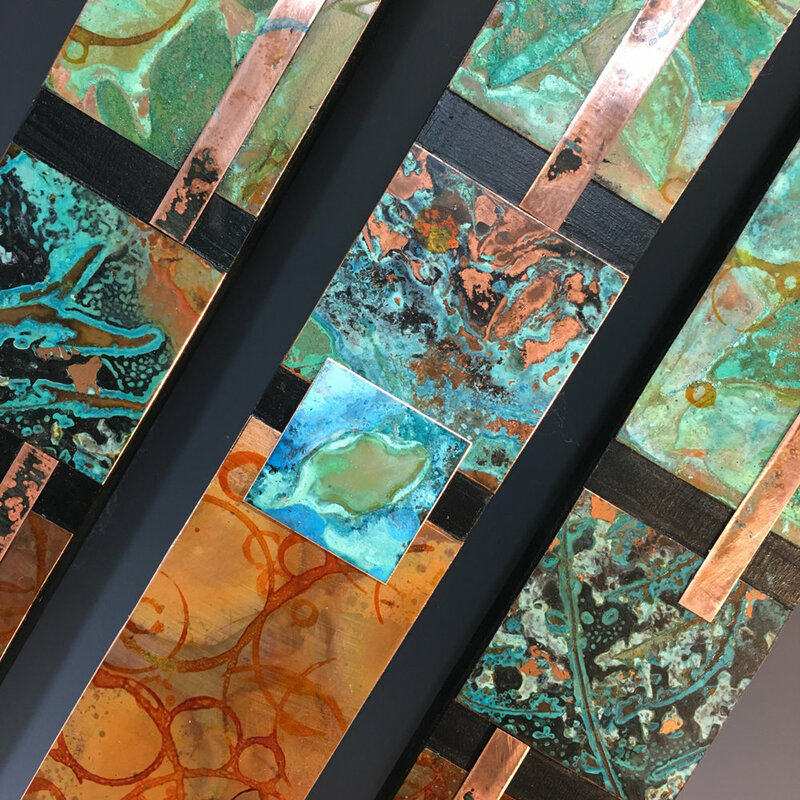 composed with assorted leaf and abstract verdigris, and flame painted copper sections, collage on wood. composed with sassafras, oak, and poplar leaves, copper pipe resist. 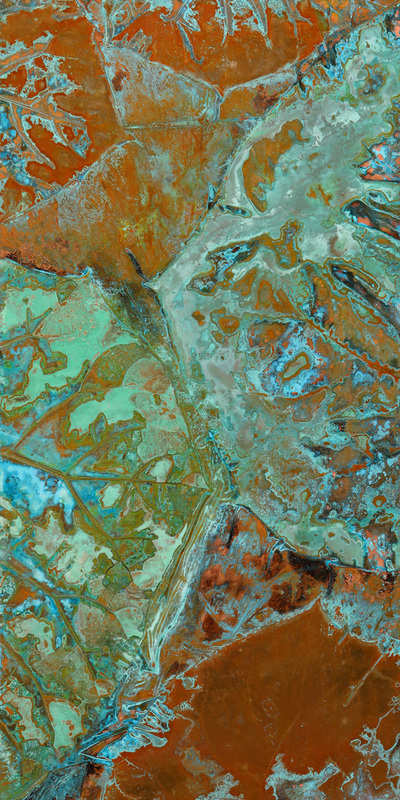 Working outdoors, the color and texture was informed by a series of rainy days during the verdigris process. Rendered with red bud leaves harvested from Hanover County, VA.
natural verdigris on copper, brushed urethane finish, distress cherry frame. composed with spring harvested sassafras leaves, kiptopeke state park, eastern shore of Virginia over redbud pods, northside, Richmond. These totems are composed of small copper panes on wooden panels. The copper panes are organic patina renderings with flame painted and solvent dye detailing. Individual totems range in size from 3" x 18" to 3" x 36"
Look for these in Richmond, VA at Crossroads Art Center or GlaveKocen gallery. Rendered with two paulownia tomentosa leaves from the Bainbridge community of south Richmond, with Japanese maple and willow leaves harvested from Oregon Hill. composed with tulip poplar leaves and copper pipe resists on copper recycled copper panel, lacquer finish. Debut at the Atlanta American Craft Council show March 15-17, Cobb Galleria Center, Atlanta, GA.